As a British person, I am used to waiting in line and taking my turn. There are other parts of the world where patient queueing is not necessarily part of local culture. Here in Doha, waiting in line at a bank or public institutions is regulated by the deli counter ticketing system. On the roads the rules are thrown away. 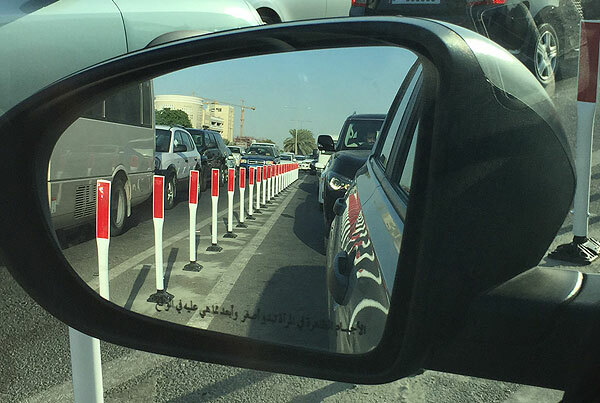 Parking lanes are frequently used to overtake long lines of waiting traffic, where the driver gets as far to the front of the line as they possibly can before forcing their way back into the traffic queue. This is both annoying and dangerous, most recently resulting in a fatal accident when the vehicle travelling along the parking lane hit a parked car. On my way to and from work I pass through the White Palace Junction on the C Ring Road. At busy times, cars turning left often have to wait for several changes of the traffic signals before the reach the front of the line. In order to get there more quickly, may drivers head down the lane for going straight ahead, then push in at the front. Sometimes other drivers, equally keen to bypass a few minutes waiting time push in to the drivers who are already pushing in. This is now somewhat more difficult as overnight a barrier has been installed. It has been interesting to see the drivers who are unaware of the line of poles who at the last minute realise they cannot make the left turn. I was so pleased to see these “sticks” as I have suffered the cars that pushed in from the straight on line for years now and it is very annoying. The chevrons on the road are just ignored, I can think of several other place these reflective sticks should be stuck up. I’m sure for the more intrepid or outrageous drivers that these stick still do not pose much of a deterrent and soon we will find them flattened or smashed completely.